F.A.Q. 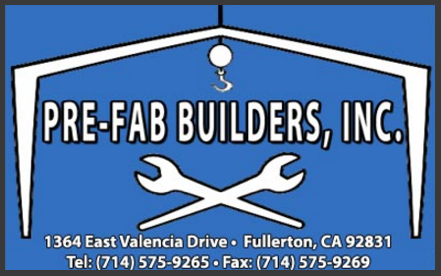 - Pre-Fab Builders, Inc.
Our California State License is: 780533 License category: C-51. FOR FURTHER INFORMATION, YOU MAY CONTACT US AT: (714) 680-3060, (714) 575-9265 OR (909) 874-3101 OR VISIT US AT OUR OFFICE. PLEASE SEND YOUR QUOTE REQUESTS VIA FAX AT: (714) 680-9660 OR (714) 575-9269.